8' power cord with battery clamps. HD water-resistant carry bag. . 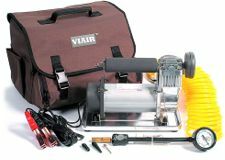 The 400 Series Portable Air Compressor from Viair™ is the most powerful portable compressor in our line-up. It is designed for both airing up and hands-free airing down tires on 4x4 rigs. The 400P can air up a 35" x 12.5" tire from 15 to 30 PSI in about 21/4 minutes. The unit comes with a Viair™ 35' air down hose (IL Inline Deflator / Inflator), the most versatile and unique air tool for airing tires up and down. . Weight - 81/4 lbs. . . The 300 Series Portable Air Compressor from Viair™ is designed for both airing up and hands-free airing down tires on 4x4 rigs. The 300P can air up a 33" x 12.5" tire from 15 to 30 PSI in under 3 minutes. 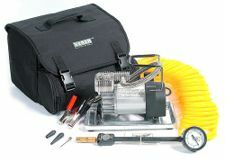 The unit comes with a Viair™ 25' air down hose (Inline Deflator / Inflator), the most versatile and unique air tool for airing tires up and down. .
33% max duty cycle at 100 PSI - at 72 F.
Size - 93/4" L x 5" W x 71/2" H.
Weight - 81/2 lbs. . .